Altering authentication information to SRM database or vCenter server system will immediately prevent SRM to function correctly. For example, you change the Administrator password for the vCenter server, SRM will no longer able to communicate with vCenter server. 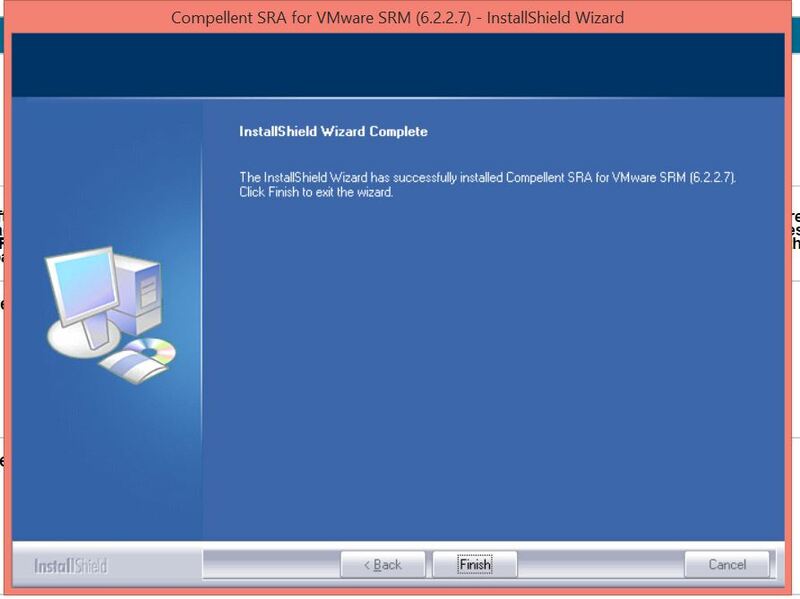 Whenever Authentication information changes after SRM installed, use Installation Repair wizard to update SRM with new credentials. 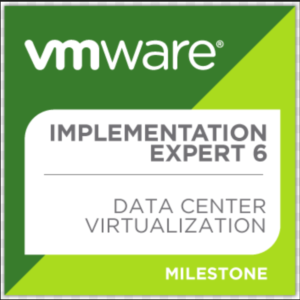 You can use Installation Repair Wizard to change the User and the Password for vCenter Server Administrator, the certification method for Authentication and the SRM database information. One important thing to remember about using the Repair feature is that it over-write the existing installation of SRM. 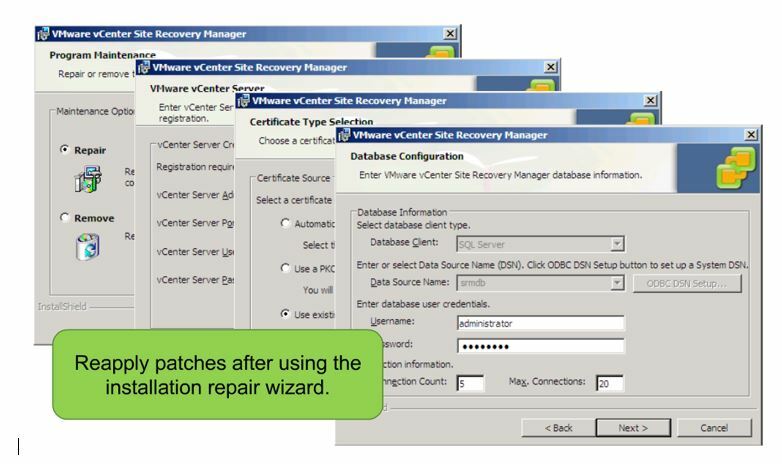 Therefore if you have applied patches to SRM and used Repair Wizard to change the User and the Password for vCenter Server Administrator, the certification method for Authentication and the SRM database information, You have to reapply all the patches. 1. Double click .EXE file to start Repair Wizard..
2. Installer will detect that SRM is installed on the server so either we can Repair or Remove from this system. Choose Repair and click Next..
3. 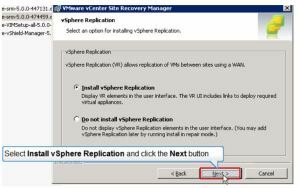 If you were using Storage-Array Replication but now want to use vSphere Replication Select Install vSphere Replication and click Next..
4. 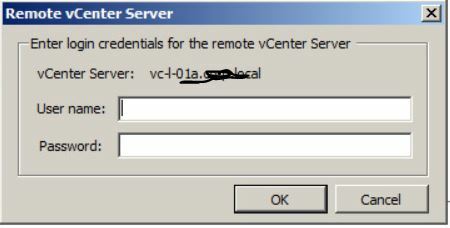 Change the User or the Password information for vCenter Server and click Next..
5. Change Certificate source if needed and click Next..
6. Change Database Configuration Information if needed and Click Next..
7. Follow the windows and click Finish to complete the Installation Repair. Once SRM is installed on both the sites, the next step is to pair the sites together. 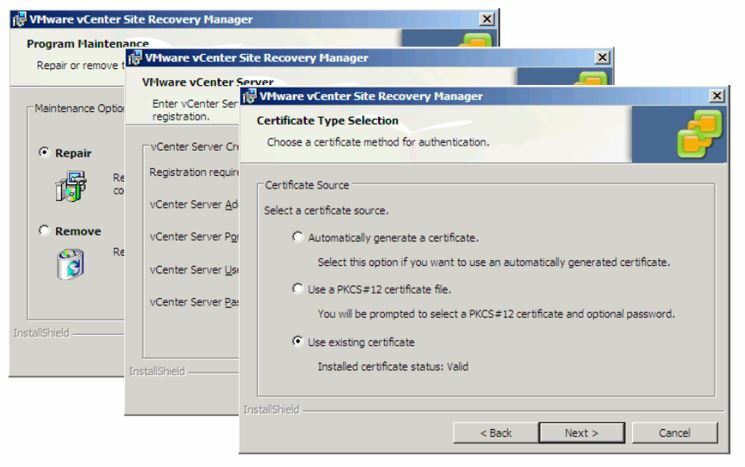 The pairing process establishes a connection between the vCenter Servers at the protected and recovery sites, which makes the SRM instances at both the sites aware of its counterpart at the other site (protected site/recovery site). Without the sites being paired, we can’t proceed further with the configuration of the DR setup. 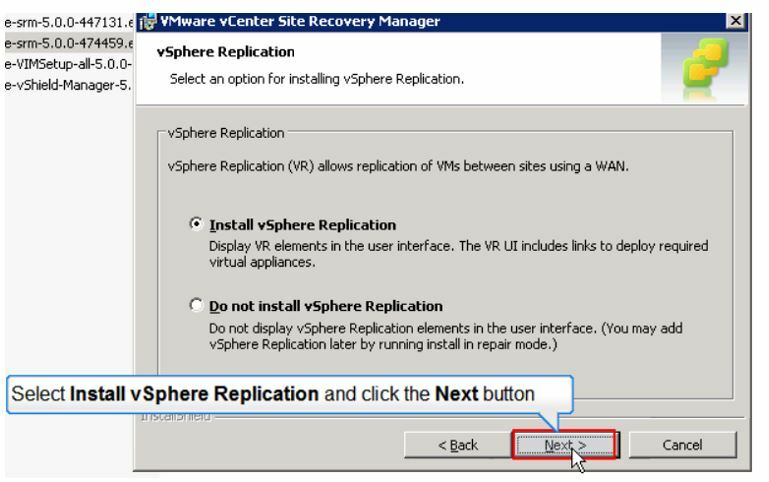 1) Connect to either vCenter Server using vSphere Client –> Home –> Solutions and Applications –> And Click Site Recovery. 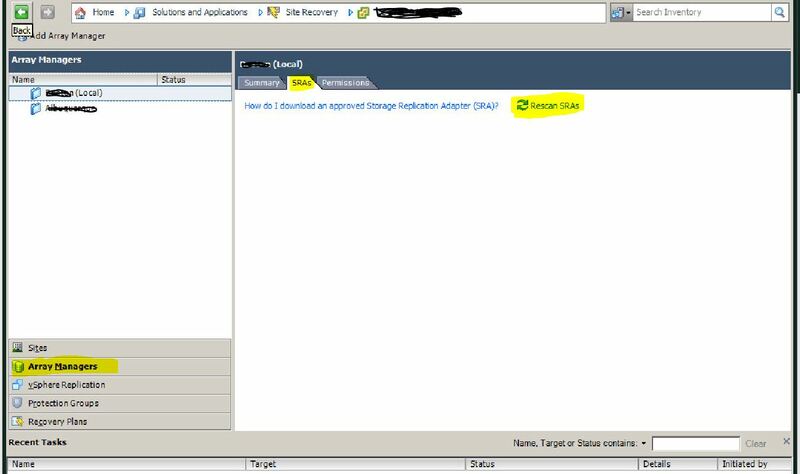 (Site Pairing can be done either from Protected Site or from Recovery Site vCenter Server). 2) Click on Sites in the left pane. 3) Right-click on the local site listed, and click on Configure Connection to bring up the configure connection wizard. 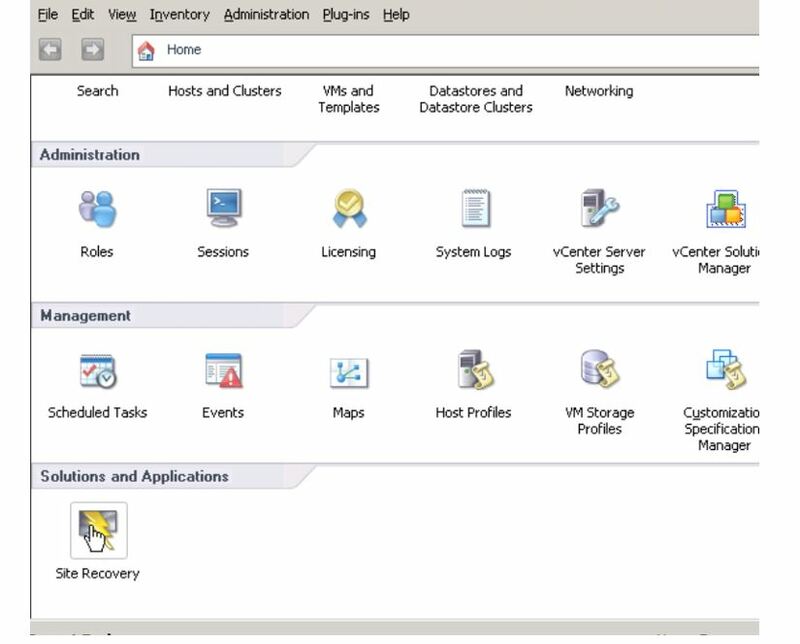 4) In the Configure Connection wizard, supply the FQDN of the remote vCenter Server and click Next to continue. Accept any subsequent certificate warnings. 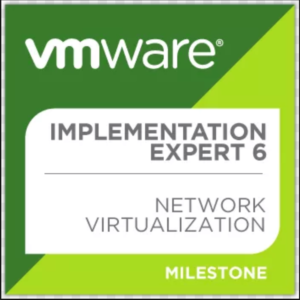 6) This will begin the pairing process, which will establish a connection with the remote vCenter Server and SRM, and also establish reciprocity. Click Finish to complete and exit the wizard. 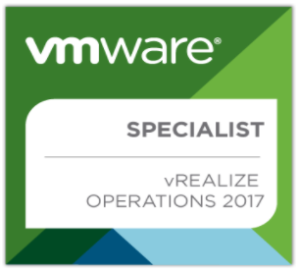 7) Once you exit the wizard, you will be prompted again for the administrator credentials of the remote vCenter Server. Enter the credentials and click on OK. Ignore any subsequent certificate warnings. Note:- Pairing is done only from one of the sites. This is because the pairing process establishes reciprocity by configuring the connection in the reverse direction as well. 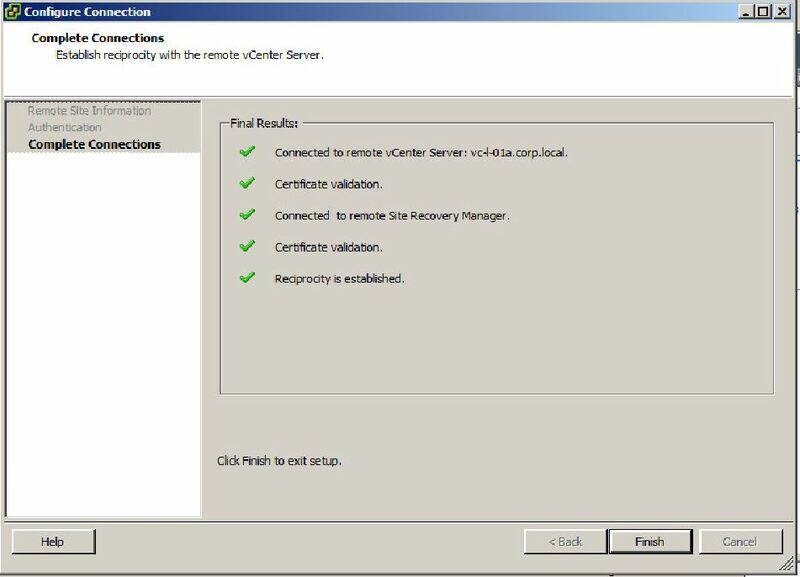 However, when you open the site recovery solution at the remote vCenter Server, you will be prompted to enter the administrator credentials of the other site. 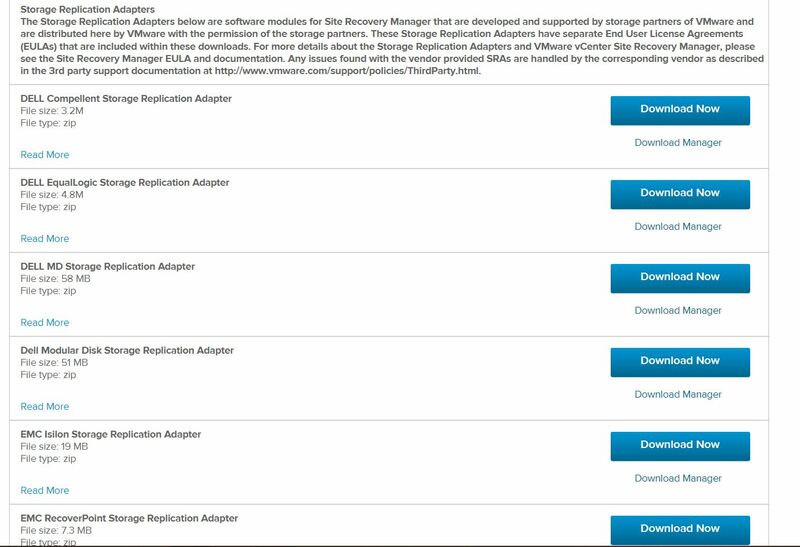 Once you have the SRM instances installed and paired, the next step is to install the Storage Replication Adapters. SRAs are coded and provided by the storage vendors. VMware certifies the SRAs and posts them as compatible with the SRM. 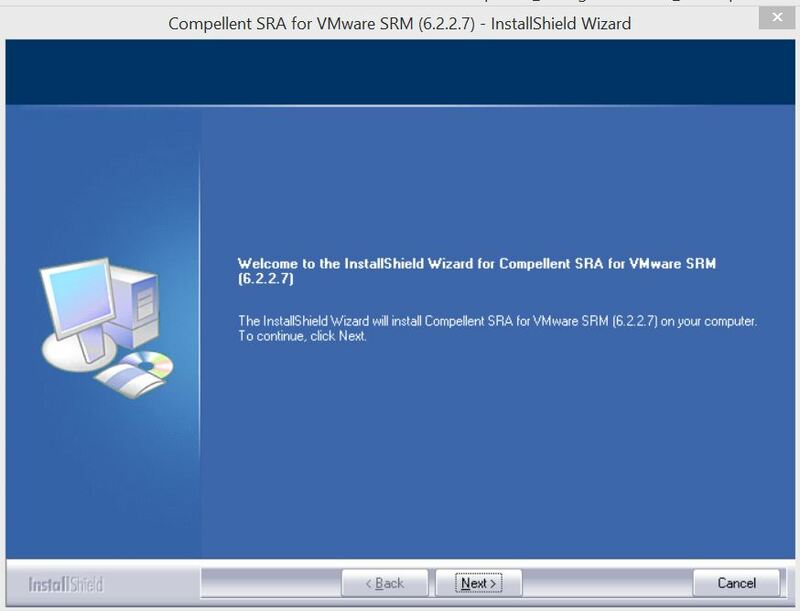 Downloading SRA The certified versions of SRA can be downloaded directly from VMware’s website. 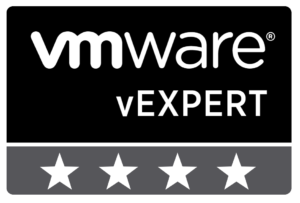 Keep in mind that most vendors publish the updated versions of SRA at their website before it is certified by VMware. Since SRA is a vendor-supported component, you can choose to install the latest version available from the vendor. 1. Go to VMware’s website at www.vmware.com. 3.Once you are at the download page for vCenter SRM, click on the Go to Downloads hyperlink listed against SRA. 4. 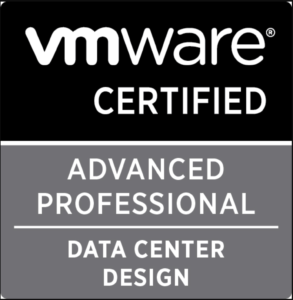 At the Download Storage Replication Adapters for VMware vCenter Site Recovery Manager page, you will see a list of all the certified SRAs. Click on the Download Now button corresponding to the needed SRA. 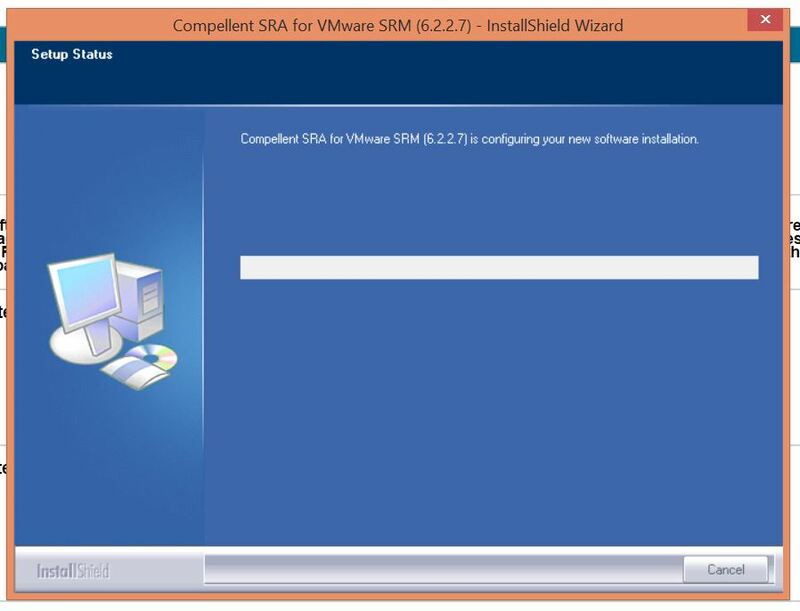 The SRA component has to be installed on both the SRM servers at both sites. 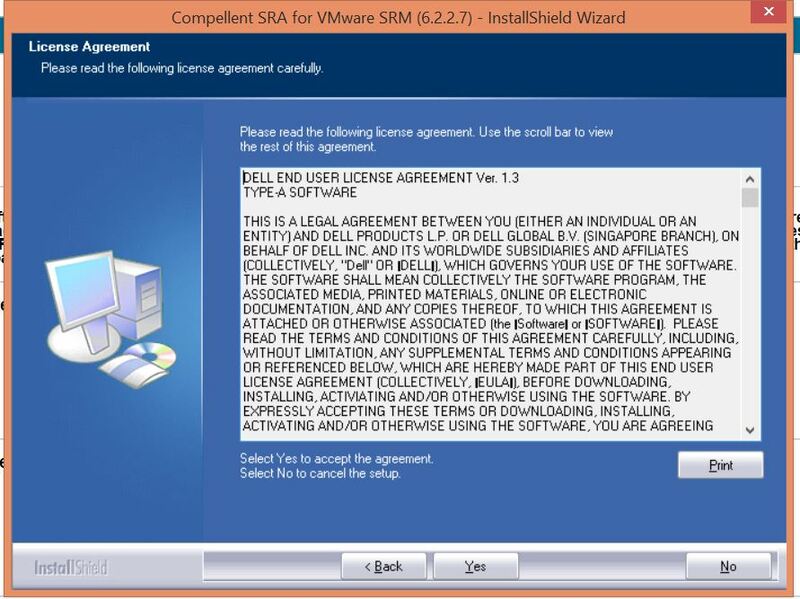 In most cases, the SRA installation is pretty simple and straightforward, but this can be different from vendor to vendor. You need to refer to the vendor documentation for the installation procedure. 2) Click on Next at the Welcome screen..
3) Click YES to accept END USER LICENSE AGREEMENT..
4) Installation Setup will start the software installation..
5) Click Finish to complete installation. 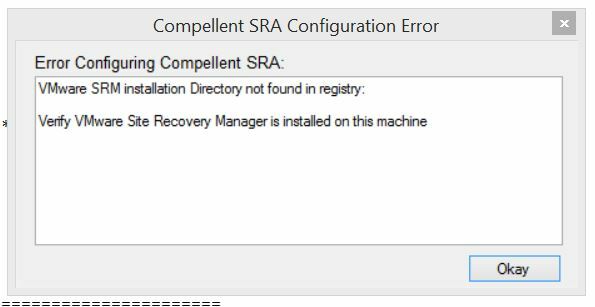 6) You Need to install SRA on SRM server If you are not installing on SRM server it will give configuration error after finishing the installation. 1. Connect to the protected/recovery site of vCenter Server using vSphere Client. 2. Navigate Home –> Solutions and Applications –> And Site Recovery. 3. Click on Array Managers in the left pane and navigate to the SRAs tab. click on Rescan SRAs to discover the installed SRA. 4. Repeat the procedure at the recovery site as well to discover the SRA. Once SRA installed and discovered at both the sites, we need to add an array manager at both the sites. An array manager is required to discover the replicated LUNs and perform other storage operations initiated by SRM. 4) Follow the windows and supply a Display Name for the array manager and an SRA Type. The SRA type value field will be prepopulated with the SRA that is already installed. Click on Next to continue. 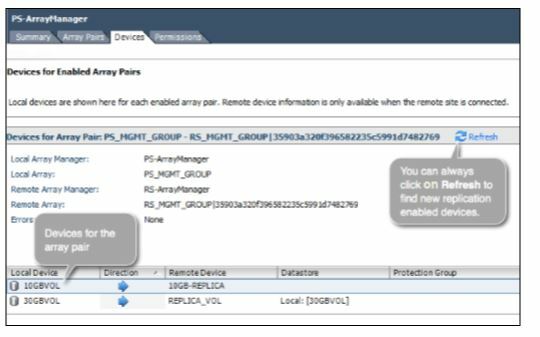 5) Follow the windows and provide vendor specific Storage Array details and Click Next. 6) Repeat the same procedure on the recovery site as well. An array pair shows the replication relationship between two arrays. Once Array Manager has been added to both Protected and Recovery Sites we need to enable an array pair. For the array manager to detect an array pair, there should be a replication schedule already created between the arrays. Refer to the vendor documentation to understand what a replication schedule means for the vendor’s array and the procedure to create it. 1. Make sure that there is a replication schedule enabled between the two arrays. 2. 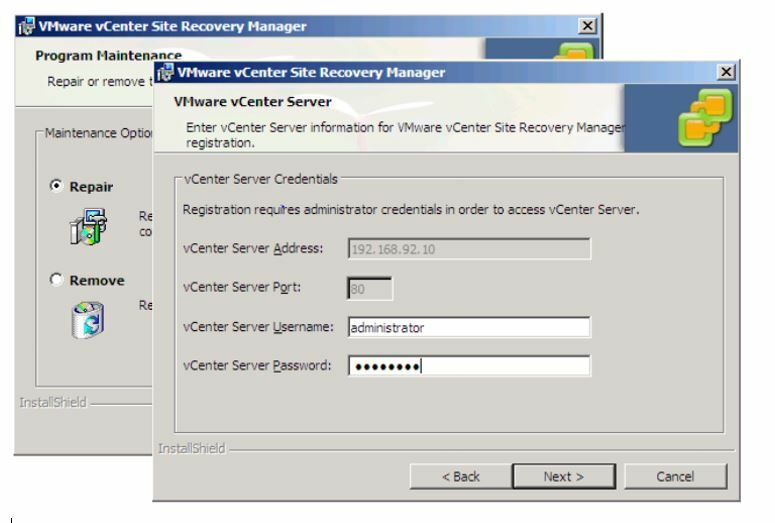 Navigate to the vCenter Server’s inventory home page and click on Site Recovery. 3. Click on Array Managers in the left pane. 4. Select an added Array Manager (local or remote), and click on Refresh to discover an array pair. 5. If the Refresh action discovers an array pair, the array pair will be listed. The Refresh action has to be done at both of the sites. 6. Array pairs discovered are not enabled by default. To enable an array pair, select an array pair and click on Enable. This operation has to done at only one of the sites. This entry was posted in Site Recovery Manager, SRM 5.X and tagged Array, Array Manager, Array Pair, BC, BC/DR, business continuity, business continuity plan, disaster, disaster recovery, DR, Install and Configure Array Manager, MTD, Pairing SRM, Roshan, Roshan Jha, RPO, RTO, site recovery, Site Recovery Manager, SRA, SRM, SRM 5.X, vCenter Site Recovery Manager, VR, WRT by jharosh. Bookmark the permalink.